Exactly as described, material is exceptional! I love it! Silvertone chunked stripes, in varying widths, are block pieced here in bold rectangles, with solid ivory pique and ivory ribbed blocks interspersed throughout to create a contemporary tonal gradient. This piece is ideal for accenting both modern and classic spaces. It's also conveniently pre-washed for softness. Love!! I highly recommend this product!!! This is a very nice sham for a man's bedroom. I purchased it for my bachelor son, who had just purchased a grey bed spread. The colors looked really nice with grey [a big color this year] and they are not too frilly or feminine. So many of the shams are way too "girly" for a guy. These are perfect! 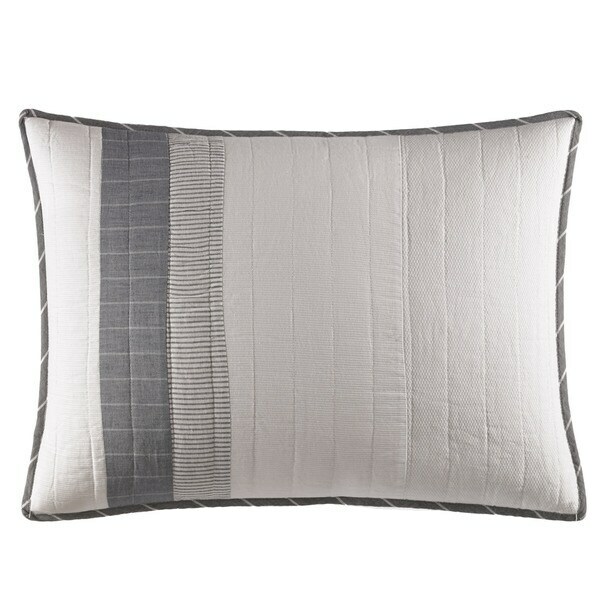 Classic shams, goes perfect for the room décor. Nice quality fabric. Color is vibrating. Exactly what I was looking for. Lovely set. Feels good and substantial. Nice color. "Is the ivory color a true white or cream?" It is white. I hope it helps. I use king size quilts on my queen size bed. Queen size always looks skimpy to me. So therefore I only need queen size shams. Kings are too big. Looked tailored for the bed.